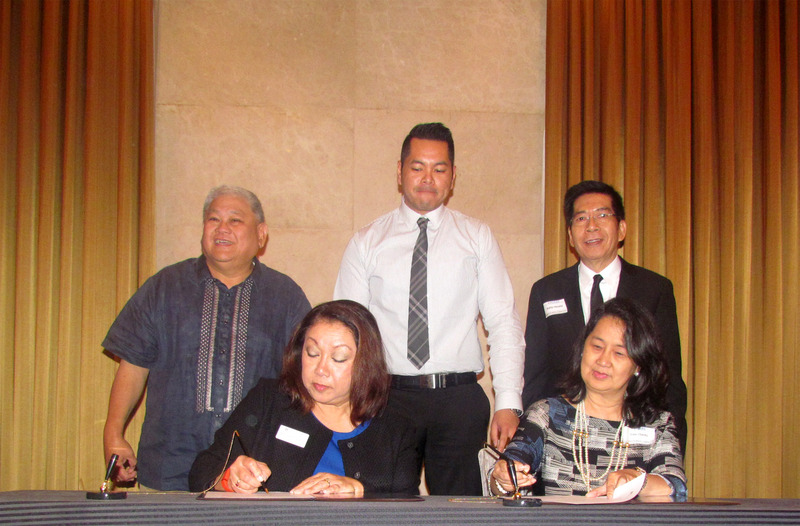 The Philippine Council for the Advancement of Association Executives (PCAAE) and the Scottsdale, Arizona-based HelmsBriscoe signed a memoranda of cooperation (MoC) recently at the Marriott Hotel Manila. HelmsBriscoe http://www.helmsbriscoe.com is the global site selection leader for corporate and association business meetings and events that will provide PCAAE members cost-free technical assistance and the best possible value for money for their conferences and other activities. PCAAE www.pcaae.org is the only membership organization in the country that serves the community of institutions and professionals that manage business, trade, philanthropic, scientific, medical, educational, technical, social welfare, agricultural and other non-profit organizations. In the photo are (standing from left): Mr. Butch Cabalu and Mr. Cris Crame of HelmsBriscoe; and Mr. Octavio B. Peralta, Chairman, PCAAE. Sitting from (left): Ms. Marisa F. Crame, Senior Director, Global Accounts, HelmsBriscoe; and Ms. Carmelita Chavez, President, PCAAE.